Jupiter Outpatient Surgery Center has achieved accreditation by The Joint Commission on Accreditation of Healthcare Organizations (JCAHO). 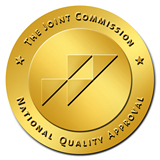 The status as an accredited organization means Jupiter Outpatient Surgery Center has passed a series of rigorous and nationally recognized standards for the provision of quality health care, set by The Joint Commission. The accreditation process concentrates on operational systems critical to the safety and quality of patient care. To earn and maintain accreditation, an ambulatory care organization must undergo an on-site survey by a Joint Commission survey team every three years. The objective of the survey is not only to evaluate the organization, but to provide education and guidance that will help staff continue to improve organization's performance. Not all ambulatory healthcare organizations seek accreditation and not all undergoing the on-site survey are granted accreditation. The Centers for Medicare and Medicaid Services (CMS) officially recognizes The Joint Commission's Ambulatory Care accreditation requirements for surgical centers, and Joint Commission-accredited ambulatory surgical centers have "deemed status" and are eligible to participate in the Medicare program.